Hello, Rachel from the Digital Harrisburg Initiative here. ‘Your message of November 20 concerning “restrictive covenants” in Harrisburg, Pennsylvania, was referred to our unit for a reply because records of the Federal Home Loan Bank Board (Record Group 195) are in our custody. The Home Owners Loan Corporation “City Survey File” for Harrisburg among these records includes a security map (36 inches high x 24 inches wide) with area descriptions keyed to the numbered and shaded portions of the map (22 pages). The file also includes the confidential report (22 pages) along with the appendix (50 pages) which is also keyed to the numbered portions of the map. '” And that is how we came to digitize Harrisburg’s redlining map. Before last Fall when I was introduced to redlining in Chicago in my African-American History class, I did not know this practice existed. According to Investopedia.com, redlining is “an unethical practice that puts services (financial and otherwise) out of reach for residents of certain areas based on race or ethnicity. It can be seen in the systematic denial of mortgages, insurance, loans and other financial services based on location (and that area’s default history) rather than an individual’s qualifications and creditworthiness. Notably, the policy of redlining is felt the most by residents of minority neighborhoods.” Sociologist John McKnight first used this term in the 1960s to describe the discriminatory practice of constructing a barrier to where the bank would withhold investments. The Digital Harrisburg team jumped at the opportunity to digitize the map. We quickly got to work. First, Sarah georeferenced the map. After inputting a digitized version of the 1936 redlining map into ArcGIS, she created different shapefiles for the categories used on the map. For example, green stood for “best,” blue for “static,” yellow for “definitely declining,” and red, the most notorious of the ratings, for “hazardous.” What resulted was a patchwork image of color-coded judgement. Next, I transcribed the adjoining documents to go along with the geo-referenced map. These typewritten documents described the demographics of each ward, including population by race and national origin, property value over a 7 year period, and “influences” on the area. All of these factors together determined what color the real estate agents gave to a certain region. For example, in area with more immigrants or non-whites alongside the railroad tracks, like in the First Ward, near Steelton, the property value was lower, and the area was designated a “red” zone. However, an area mainly composed of white businessmen separated from the railroad, like the Fourteenth Ward up the river, had higher property values and a “green” rating. It was fascinating to examine this map, for this is not the first time our project addressed the question of race in Harrisburg. In the Fall, Arion Dominique and David Michael researched restrictive covenants, which connect to the race-driven goals of redlining. What the redlining map documentation shows is that, unfortunately, national origin and race were taken into account in the way of degrading a region’s rating. Being classified as yellow or red meant that the people living therein were much less likely to receive investment from banks or insurance companies. This made it more challenging for the inhabitants to improve their housing either by remodeling or being able to move into a more expensive property. This is a part of Harrisburg’s history, and one cannot understand the history of the region without taking this harmful practice into account. 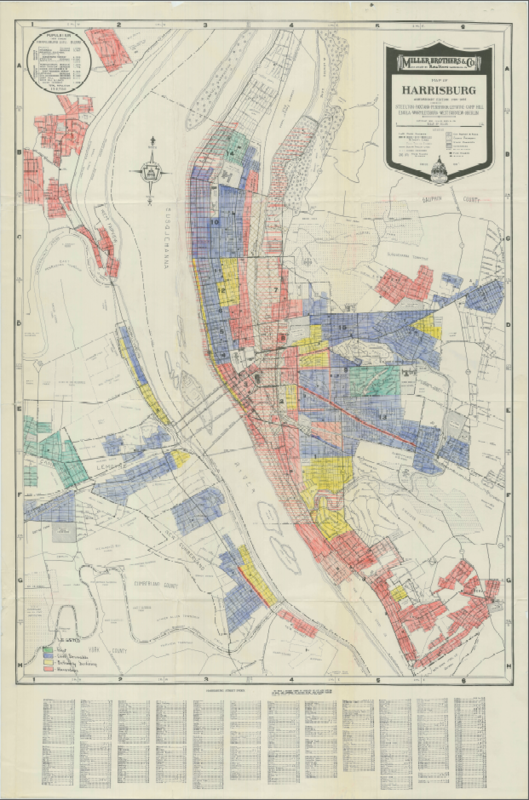 Fall term of this year, our team will be preparing interactive maps that allow the visitor to explore a redlined map of Harrisburg and 1936 and the discriminatory classification system used. Check out these articles (here and here) for contemporary instances of this infamous practice. Rachel – Thank you for the informative post. I will share your post with my AP Human Geography students at Mechanicsburg Area Senior High who are learning about urban challenges in the US and around the world. I am honored that you are sharing my post with your MASH students. The Digital Harrisburg Initiative will continue to research redlining and make news posts in the future about this topic and more. Thank you Dr. Fea! We are very excited about this discovery and look forward to future findings while researching the harmful practice of local redlining.